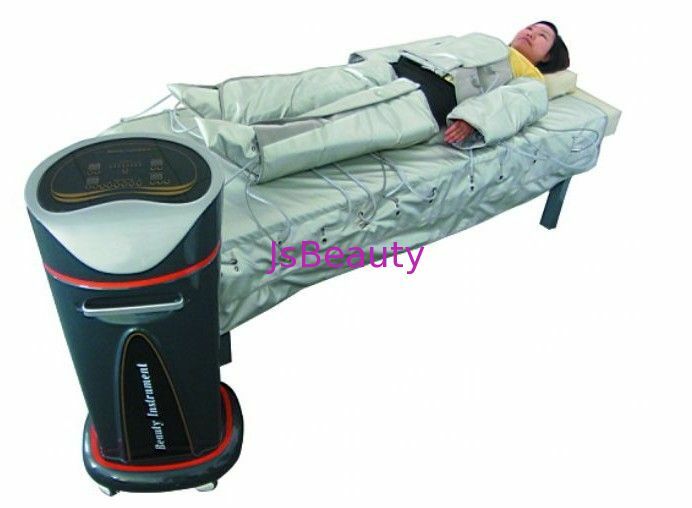 This apparatus was carefully designed according to human bionic research, which combines functions of broken-fat, fat dissolved, lymphatic drainage, magnetic therapy of firm skin in one and using high-tech means to massage, do electrotherapy and pressure therapy to get significant effect. With airbag, using pressure and the way to fat for sports. Beautician using circular, massage, slewing, traction, and other basic technique plus special instrument help, accelerate lymph circulation and excretion, keep it unblocked, in order to help them remove waste. Air wave type is used downy natural air massage, won't cause any damage and bad feelings, meanwhile, air pressure unilateral pressure is equivalent to50kg weight, in the role of abdominal 30 minutes equivalent of 150 sit-ups exercise. 4, Digital frequency control system ensures that energy output is precise. 5, Non-invasive, no side effect, no downtime, safe and pain-free. 6, Short treatment with long-lasting result. 1. Fat dissolving.Far infrared works on fat tissue and dissolve fat cells with heat radiation. Regular Inflation, deflation and variational air pressure can accelerate fat burning. 2. Fat elimination.Far infrared energy can speed up blood circulation and promote metabolism. 3. Lymph Drainage.Pressothreapy speed up the blood circulation and metabolism which enable dissolved fat entering into the blood and lymph. Air chamber works more regularly and directively through air pressure, promoting lymphatic system reflux and draining the toxin out of body. 4. Others.Inflammation diminishing, analgesia, promote regeneration of tissue and soften scar. * The lymph transports antigen-presenting cells , such as dendritic cells, to the lymph nodes where an immune response is stimulated.